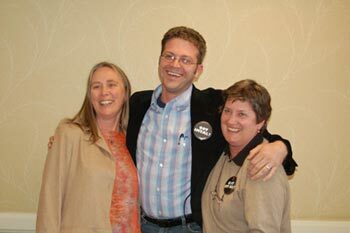 The IMTAL Board welcomed Jennifer Boyes-Manseau (left) as Publications Officer, Greg Hardison (center) as Treasurer, and Simone Mortan (right) as Vice President at the Board meeting held during AAM's 2007 Annual Meeting in Chicago, IL. After much pre-planning, the Board tentatively approved a 3-year strategic plan that outlined goals and actions in the following areas: Membership, Communications, Conferences, Long-range Finances, and Relationships with National and International Partners. IMTAL conducted public speaking workshops on two mornings for AAM attendees. Paul Taylor and George Buss instructed over 100 participants about posture, voice, power point, and other elements of successful presentations at the conference as well as with museum visitors. More than thirty old and new friends gathered for the IMTAL luncheon on May 14 where Jeff Patchen, President and CEO of the Children's Museum of Indianapolis, was presented with the first annual IMTY award for his extensive support of museum theatre in his institution. President George Buss led the group in an interactive dramatic exercise exploring the dimensions of resources, skill, and process vs. performance in museum theatre. IMTAL founder Catherine Hughes also updated the group on her research exploring connections between memory and emotion. Past President Paul Taylor sat on the panel for a well-attended session titled Utilizing Museum Theatre Techniques to Create Lasting Memories with Joshua Estes from the Children's Museum of Indianapolis and Pamela Duncan from Imagine It! Children's Museum of Atlanta. Paul performed The Widow's Lament with IMTAL's Past Past President Lynda Kennedy, The Children's Museum of Indianapolis presented Levi Coffin about a pioneer of the underground railroad from Indiana, and Imagine It! Children's Museum of Atlanta performed an excerpt from It Happens at Night, a musical about bedtime. The Museum Theatre Showcase, prominently featured in the center of the Expo Hall, was a huge success, welcoming performances from around the country. Adam Lucky from the Kentucky Historical Society performed Look for My Picture, The Children's Museum of Indianapolis performed Levi Coffin, and Christina Myatt from the Putnam Museum performed Making a Difference in Our World: the Story of Rosa Parks on Tuesday, May 15. Simone Mortan from the Monterey Bay Aquarium performed When the Whistle Blew, Steve Gensler from the National Children's Museum performed Why the Bat Flies at Night, and Christina Myatt from the Putnam Museum performed Kate Perry Mosher: Southern Sympathizer on Wednesday, May 16. Again this year, IMTAL members at the conference received “Got IMTAL?” buttons. This was a successful way to raise awareness of our organization, with many conversations started by the buttons. If you are attending a conference in the near future, contact the IMTAL membership officer to get your IMTAL button and wear it proudly! Plans are already underway for next year’s annual meeting in Denver, CO. In the meantime, join us at AATE in Vancouver this July or at the international conference in Northern Ireland in September. Let us know how we can help you spread the word about IMTAL at any conference you might be attending. Feel free to contact any member of the board for more information.